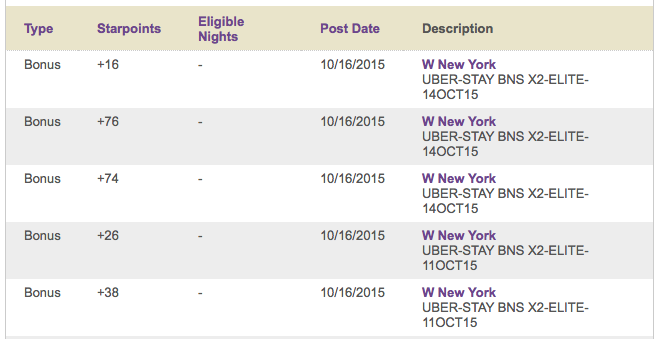 I was in NYC last week for a few days and used my fair share of Uber's to get around the city. 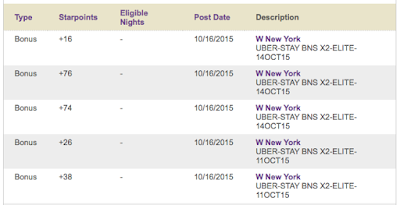 Earlier in the year, Uber and Starwood rolled out a partnership where SPG members would earn 1 point/dollar spent on Uber's and 2 points/dollar spent on Uber's during a Starwood stay. That bumps up 3 pints/dollar spent for elite members. While I would use Uber to get around the city anyway, an extra ~300 Starpoints is a nice bonus. The points (standard and bonus) post in a couple of days and I've never had a problem with the points posting accurately. My Uber account is linked to my Chase Sapphire Preferred card where I also earn 2x points on my Uber spend. Earning 5x points on Uber rides is pretty awesome. Is Earning 2 Membership Rewards Points/Dollar on Uber Rides a Good Deal? 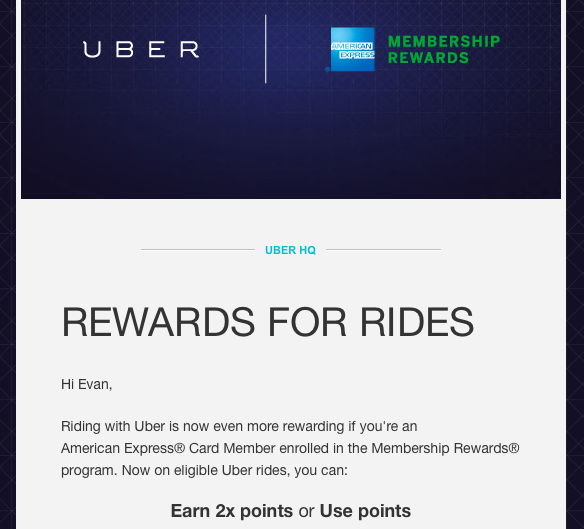 Last week, American Express and Uber rolled out a new partnership that essentially gives Amex card members (with a MR earning card product) the ability to earn 2x points on Uber rides. They also launched the ability to redeem Membership Rewards points for Uber rides which is definitely NOT a good deal. Membership Rewards points are pretty valuable thanks to great partners (i.e. 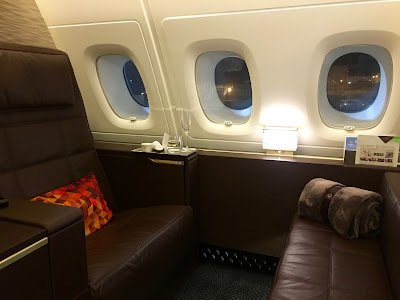 Singapore Airlines, British Airways, etc...) and easy to rack up thanks to monster (i.e. 100,000) sign-up bonuses and a variety of consumer and business card products. I value you them on par with Chase Ultimate Rewards points (about 2 cents each). I personally have my Uber account linked to my Chase Sapphire Preferred Card. Because Uber is coded as "travel" I will earn 2x points per dollar spent and also earn a 7% annual divided on that spend. The dividend effectively makes my earnings 2.14x so while the new partnership with Uber is really cool, I will stick to my current setup! If you don't have the CSP card, definitely link your Uber account to a Membership Rewards earning Amex card. So we had quite the morning trying to leave Denver for a week in Playa Del Carmen, Mexico. It's a bit of a long story but worth telling for a couple of reasons. First, to reiterate the huge benefits of having the United (or your favorite airline) mobile app downloaded on your phone. Second, this is my blog and I can write about whatever I want. We woke up this morning with plenty of time to shower, pack, have breakfast and head to DEN for our 10:15AM direct flight to Cancun. In the middle of packing, Emily noticed there was a pretty strong odor in our laundry room and shower. It smelled like gas. Our first thought was "this can't be good" but we weren't exactly sure what to do other can call the gas company and get their thoughts. We called the emergency line and they said that we should get out of the house immediately and they would send someone out "within the next hour or so." So we left the house essentially in our pajamas with the lights on and walked across the street to get some coffee.